Kakinada JNTU M.Tech MBA Admission 2018 - Application Form at www.jntuk.edu.in. JNTU Kakinada M.Tech and MBA Admission 2018-19 Application Form. JNTU M Tech Admissions 2018 Jntu Kakinada Admission Procedure Jntu Kakinada Management Quota Jntuk M.Tech Entrance Exam Jntuk M Tech Courses M.Tech Distance Education In Jntu Kakinada Jntu Kakinada Mba Fee Structure and Jntu Kakinada M Tech Placements. The Jawaharlal Nehru Technological University (JNTU) Kakinada has published ADMISSION: Applications are invited for admission to M.Tech and MBA courses for the academic year 2018-19 offered at Kakinada and Vizianagaram Campuses, JNTUK, Kakinada. The eligible candidates can apply application before 08th August 2018. JNTUK Kakinada Admission to PG and Research Programmes 2018-19. Jawaharlal Nehru Technological University JNTU Kakinada invites applications for admission into M.Tech/ MCA/MBA Programmes for the academic year 2017-18 offered by JNTUK, KAKINADA at University College of Engineering Kakinada Campus, University College. The candidates with requisite qualifications are eligible to apply. The order of priority in selections for admissions shall be i) Working Experience (minimum of 1 Year) Rank in GATE, GPAT, ICET, Rank in PGECET -2018 and Marks obtained in the qualifying examination. The applications received in response to these notifications in the prescribed format will only be considered. No other requests for admission’s will be entertained. Admission is subject to the number of applications received. The candidates should have passed the appropriate qualifying examination with at least 50% marks (45% of marks in case of reserved categories). Reservation of SC/ST/BC categories will be as per rules. 33 1/3% of seats are reserved for women in all categories. Note: Separate application must be submitted for each Specialization. Candidates must fill in the Discipline/Branch applied and specialization in the application. The University offers no scholarship /stipend. Hostel Facility not extended for the sponsored candidates. Registration fee of Rs. 1000/- to be paid in the form of crossed Demand Draft drawn in the name of “The Registrar, JNT University Kakinada” payable at Kakinada, along with the application. i) Bank Demand Draft for Rs. 1000/- (separate form for each specialization applied). ii) Self Attested copy of degree, date of birth, service and salary certificates iii) SPONSORSHIP CERTIFICATE” from the employer in the prescribed proforma. v) Self Attested copies of GATE -2018 / GPAT 2018 / ICET-2018 /PGECET-2018 (Hall Ticket and Rank Card). vi) Self Attested Copies of Qualifying examination marks memo. The counseling schedule will placed in JNTUK website at www.jntuk.edu.in, The candidates, are advised to attend admissions as per the plan along with necessary certificates. The number of candidates may attend the counseling than the number of Seats available and mere attendance at the counseling does not guarantee allotment of a seat. Applications received after the due date / incomplete application in any respect will be summarily rejected. No correspondence will be entertained in this regard. The registration’s fee will not be refunded under any circumstances. The Universities reserves the right to make alterations in the intake and rules for admission. If it is detected that a applicant has been admitted due to any mistake made inadvertently in the processing of online applications and during the admission stage, the University reserves the right to cancel the seat at any stage. The admission will be closed within one month of the commencement of the first-semester class work irrespective of the Vacancies. If any dispute concerning admissions in the courses of JNTUK arises, the jurisdiction shall remain with the Courts in Kakinada only and the High Court of Andhra Pradesh. The University’s will not be responsible for postal delay/loss in transit. 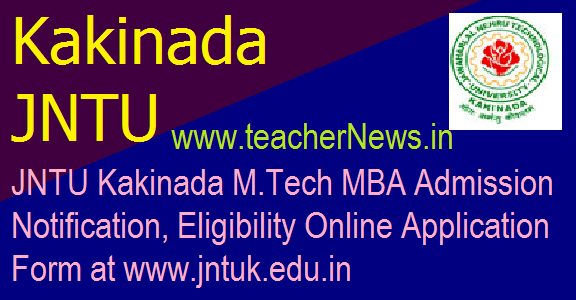 JNTU Kakinada M.Tech, MBA and MCA Admissions 2018 Application Form, Eligibility Criteria, Registration fees, Selection Process and Counseling Dates at www.jntuk.edu.in.